I’ve been thinking about a series of posts over the last few months all about “how life has changed!”. I like to think of myself as a fairly social “young man” and I certainly lived that life but with the introduction of my daughter 2 years ago Life Has Changed. In all reality it was an easy transition but every now and again something clicks and I realised that my life has changed. I’ll be the first to admit that it’s for the better but it’s still fascinating that I reminisce the differences. Tonight is one such moment. First up I’ve left work early not to goto the pub but to go home and see the kids (and of course help my wife). I’ve spent the night dancing to Katie Perry, reciting “new words” & admiring finger paintings. Most telling though is I’ve watched Tinker Bell all the way through for probably the 20th time and I still laugh harder and louder that my 2yo. My favourite line …..”your mouse’s name is Cheese” says Tinka, “it must be because he always comes when we say cheese” says her tinker friend. And that’s just one of many! While I love being at home with the girls I do however need to maintain some grip on my manlyhood. So Pizza and beer is on the menu while I watch Tinker bell with my lovely girl snuggled beside me. What more could you want?!? Day 2 – no Microwave. Day 2 lacking a microwave has been fairly uneventful as far as the microwave goes. It’s amazing how you just adapt. The usual breakfast of porridge was substituted for weetbix though had I got up a little earlier I would have made it on the stove top! Maybe tomorrow. 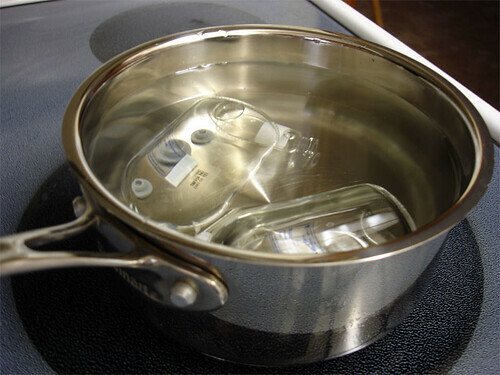 Baby bottles were boiled using my largish sauce pan on the stove. I agree with some of the comments I’ve received that you don’t have to sterilise them but something in me thinks I should. As a facebook friend says she does we bought some diced lamb fresh and marinaded in a souvlaki-ish marinade of 4 squeezed limes, bay leaves, garlic, salt, pepper, oregano, rosemary and olive oil. Pan fried and served in some left over tortilla wraps with lettuce, tomato and onion. Tomorrow’s sunday and I love a good Sunday cookup so the original plan was to make a corned beef silverside from the freezer and get it out to defrost overnight but we’ve switched to some freshly bought chuck steak for a slow cooked casserole of sorts – recipe to be decided at time of cooking. While it’s only day 2 I’m starting to think of other seemingly essential kitchen items as a waste of space. Could I get rid of my kettle? I know I “could” get rid of the dishwasher but that’s just a supplement for me. What else do you have that you could get rid of and free up the space? 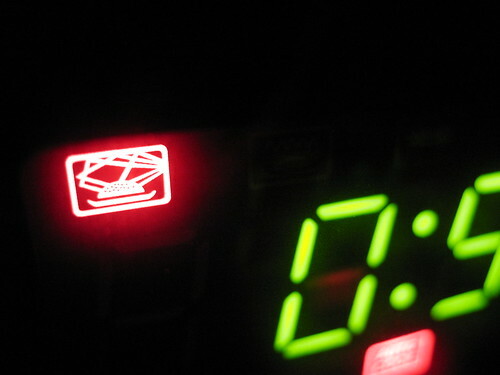 Today I received a call from my wife that our microwave had started “sparking”. She had already called the manufacturer and explained that it’s taken a beating recently due to the seemingly endless 4min cycles of baby bottle sterilization. As expected they claim misuse while we claim faulty unit but at least they’ll supply a loan while they look to repair. But that leaves me with the dilemma of no microwave for 2 and a bit days! I’m sure many of you are probably thinking “Why are you using a microwave anyway” but truth be told I haven’t stopped using it since my pre-gardening / cooking / bachelor days. Beyond baby bottle sterilization it’s used for defrosting (which is all reality should be called defreeze, the frost isn’t my problem, it’s that it’s frozen!) meat, cooking rice and even steaming vege’s (yes I know this is bad). However despite the inconvenience I’m taking this as an opportunity to move away from the (apparently – still need to research it properly) dreaded microwave. Pan fried pork loin chops – bought today so they weren’t frozen which is probably a good thing. Oven roasted root vege’s and capsicum – always a crowd favourite and we ended up with 2 lots of vegetable delivery from Aussie Farmers Direct (trialling them) and an accidental top up from the grocery store. Steamed broccoli and bok choy. It’s the steamed vege’s that brings the a-ha moment for me. I pulled out my bamboo steamer and I’m pretty sure that with the help of boiled water from the kettle I had them steamed up in about the same time as a microwave would take. And assuming microwaves aren’t ideal I had the desired outcome without additional effort. I’m still yet to boil up and sterilise the baby bottles old school like my parents did but it’s certainly an eye opening experiment to go without the microwave. Do you use a microwave? If you’ve given it up why? and how have you found the transition. Let’s see how day 2 goes. Stay tuned!